Ben Rhodes, driver of the No. 41 Carolina Nut Co. Ford F-150 will start on the pole for tonight’s Eldora Dirt Derby at Eldora Speedway in New Weston, Ohio. This is Rhodes’s second career pole, and his first at the 1/2-mile dirt oval, in three starts. 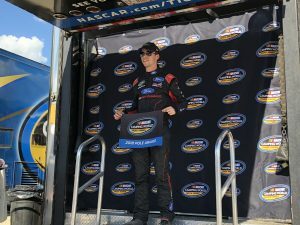 Furthermore, this is the second pole for ThorSport Racing in 2018, and the team’s 25th in NASCAR Camping World Truck Series competition. The Sixth Annual Eldora Dirt Derby broadcasts live starting at 9 p.m. ET on FOX Sports 1 (FS1), the Motor Racing Network (MRN) and SiriusXM NASCAR Channel 90.